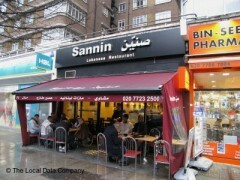 About: Sannin offers a variety of cold and hot mezze, sandwich wraps, numerous main dishes. im a regular customer at sanin and with time love this restaurant. its lively ambience and friendly arab staff give it its own life. lovely food and perfect accent to the street its on ! A 5 star for sure ! Sannin was just lovely, never having had Lebanese food before I was a bit apprehensive but everything was delicious and the service was great. We had the hummus dip which was delicious and all the mains were so good, the meat was delicious and tender. Going back again tonight and we can't wait.